A couple of weeks ago, our partners at CCT (the Education Development Center’s Center for Children & Technology) were formally notified that September 15th would mark the kickoff of our long-anticipated 3-year ITEST project. ITEST is the Innovative Technology Experiences for Students and Teachers program. Our project, “Investigating Digital Badges as Alternative Credentials to Broaden STEM Participation Among Underrepresented Youth,” will look closely at Mouse’s Design League program in order to substantiate factors that influence the trajectory of young people — especially minority youth outside of the most typical STEM pedigree —moving into our (fingers crossed) next generation of creative technologists, engineers, and designers. Why do we care so much about the project? First, it will help guide the practical ways that Mouse carries out its mission. We’re looking to close the gap between those with access to practical academic and career tracks in STEM and those who don’t yet. To do that, our field needs to create not only new interest, but also new pathways that lead from learners’ point of enthusiasm all the way to their next step as they form that identity. If we get them excited and then send them away, trusting that someone else will grab the baton, we might not fail them entirely but it’s not enough to shift the paradigm. We’ll know more from this research about how institutions can work together to reroute systems in a way that makes access a priority. We’ll know more about whether treating learners like budding professionals (better supports for skills to build a portfolio, endorsing credentials earned afterschool, making them more aware of the value of their work) will influence their desire to be one. We’ll pilot and test better practices for capturing project learning, and we hope to make those into shareable blueprints that learning ecosystems beyond New York can replicate and remix. And we plan to share challenges and outright failures, as these may very well be as valuable as the rest of what we discover to those watching our progress. Does the Design League Badge Portfolio process support participant engagement by increasing their STEM and ICT self-efficacy and interest in STEM and ICT careers? What revisions have to be made to the existing badge and Learning Portfolio systems to enhance participants’ capacity to create Badge Portfolios that are personally meaningful and present their ICT capabilities to higher education admissions officers? What revisions have to be made to the existing systems to ensure the continuity of the process for recognizing and credentialing youth ICT ability across the partner organizations? Those partner organizations are what makes this work so full of potential. CCT’s Dr. Jim Diamond and team will lead this research. The Learning Design team at Mouse will lead and expand our Design League program for the project, and lead technical development of the portfolio and credentialing platform. Colleagues at Parsons The New School for Design will serve to co-design credential and portfolio systems, and involve admissions professionals from the university to advise. The DreamYard Project will host a satellite program site for the Design League in the Bronx, and also support the portfolio technology design. The project will build from years of prior work between DreamYard and Parsons to distill best practices for educators seeking portfolio-driven environments for their classrooms. The vision of the collective is that by carefully stitching together these strands of work — portfolio learning and alt credentialing — into a shared context, we can illuminate more about the practicality of creating new pathways together, and how their implementation can improve the footing for the learners we serve. You can read the project abstract on the NSF’s website, and stay connected to Mouse for updates. 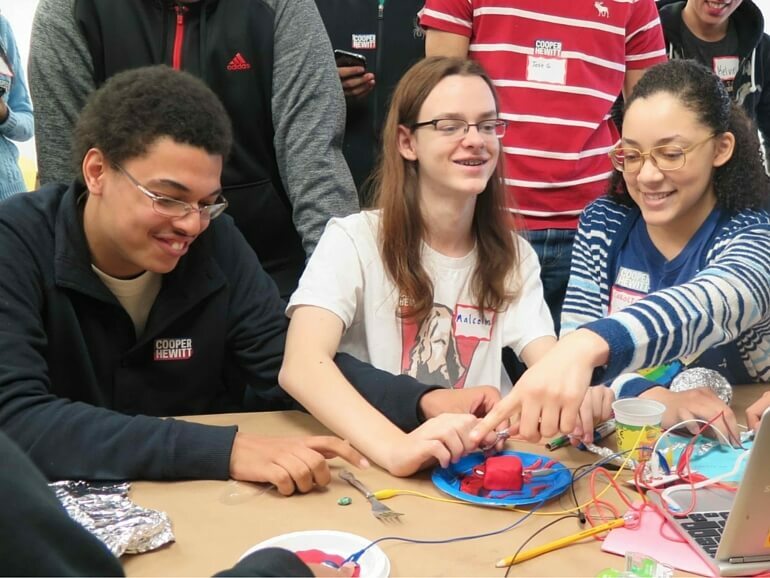 < Create with Mouse on Maker Day on November 19th!